Last week, President-elect Donald Trump took to Twitter to claim that Masayoshi Son, CEO of SoftBank of Japan, had agreed to invest $50 billion in the United States toward businesses and create 50,000 new jobs, and that “Masa said he would never do this had [Trump] not won the election!” As usual, the claim that Trump negotiated this deal is disputed, since SoftBank had announced plans to create a $100 billion technology investment fund, together with a public investment fund of Saudi Arabia, in October, before the election. Second, foreign investment in the U.S. economy is dominated by foreign purchases of existing U.S. companies. Between 1990 and 2005, foreign multinational companies (MNCs) acquired or established domestic subsidiaries that employed 5.25 million U.S. employees. The vast majority (94 percent) of jobs associated with those investments were in existing firms acquired by foreign MNCs. However, 4 million of those jobs disappeared through layoffs or divestiture of part or all of those companies, as shown in my 2007 paper, The Hidden Costs of Insourcing. A classic example was the acquisition of IBM’s PC business by Chinese computer maker Lenovo in 2005. Lenovo shut down PC production in the United States and substituted PCs made in China and elsewhere in Asia. So PC production jobs in the United States disappeared. The disappearance of jobs in firms acquired by foreign MNCs continues today. The Commerce Department’s Bureau of Economic Affairs stopped collecting data on employment in firms established or acquired by foreign investors in 2009, due to budget cuts. However, that survey was restarted in 2014. In that year, foreign direct investors acquired or established firms employing 734,000 workers, of which only 14,700 were employed in US businesses that were either newly established or expanded (BEA Survey table 4.1). However, total employment by all affiliates of foreign MNCs in the United States increased by only 48,800 workers between 2013 and 2014, so on net, foreign MNCs effectively either laid off or divested subsidiaries employing nearly as many workers (685,200 or 93.4 percent) as the workers in subsidiaries established or acquired in 2014. SoftBank provides a clear example of plans to acquire and merge existing U.S. businesses. Press reports indicate that Softbank, which had acquired Sprint in 2013, was considering plans to merge it with German owned T-Mobile, but dropped those plans after U.S. regulators indicated that they would reject the deal. After meeting with Trump, SoftBank President Son expressed hope that Trump would appoint a new Chair of the Federal Communications Commission, who might approve his T-Mobile merger. Such mergers usually lead to layoffs as a result of consolidations in management, marketing and other business functions, and the loss of thousands of U.S. service sector jobs. Finally, U.S. subsidiaries of foreign MNCs have also contributed substantially to growing U.S. goods trade deficits, which are responsible for the loss of millions of U.S. manufacturing jobs over the past fifteen years. U.S. subsidiaries of foreign MNCs have consistently run trade deficits in every year from 2000 to 2014, as shown in the figure below. These deficits increased by $93.3 billion between 2000 and 2014 because imports by those subsidiaries increased by $362.9 billion, more rapidly than did exports by those same firms ($269.6 billion). U.S. subsidiaries of foreign MNCs were responsible for more than one-third to more than one half of the overall U.S. goods trade deficit in this period. While U.S. exports of foreign MNCs did support some U.S. jobs, imports by those same firms eliminated substantially more domestic jobs. 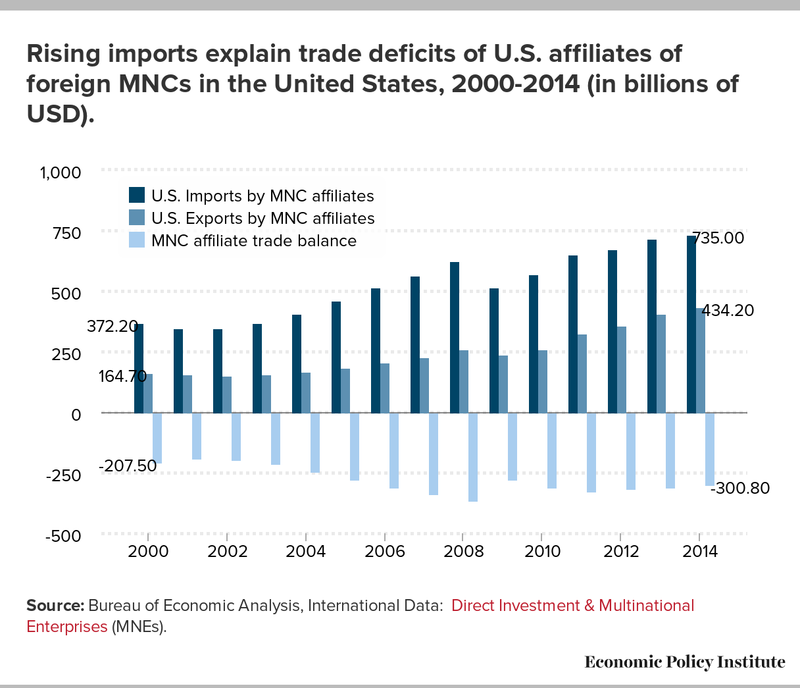 Rising imports explain trade deficits of U.S. affiliates of foreign MNCs in the United States, 2000-2014 (in billions of USD). Source: Bureau of Economic Analysis, International Data: Direct Investment & Multinational Enterprises (MNEs). Some foreign MNCs have done more for the U.S. economy and domestic manufacturing than others. Firms such as Arcelor-Mittal and Fiat have played key roles in restructuring the domestic steel and auto industries, and have kept at least some domestic plants operating through increased investments in the United States. But the vast majority of foreign multinationals buy U.S. companies to hollow them out and use their distribution networks to increase imports, eliminating millions of U.S. jobs in the process. The lesson for the Trump administration is that when doing trade and investment deals, it’s important to look beyond the transaction on the table and to see how it might contribute (or in the case of Softbank) detract from the national goals of reducing U.S. trade deficits and rebuilding U.S. manufacturing.